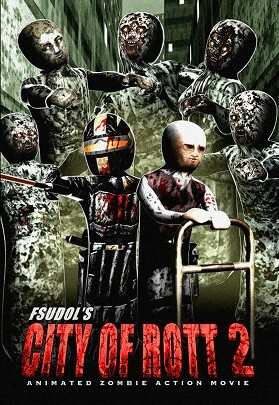 City of Rott 2 now on DVD!!! Buy it now. After 8 years since the 2006 release of City of Rott, its sequel has finally arrived on video, October 1, 2014, just in time for Halloween. Join Max the renegade, and Harry the walker wielding wise man in their danger filled quest to put things right in the City of Rott. Hundreds of zombies to dispatch, loads of bloody action to wade through, and an exciting new story to experience! The following Link is a Dread Central Article announcing City of Rott 2 Shambling to DVD! Special Thanks to Dread Central’s “Uncle Creepy” Steve Barton. Buy it now on http://www.amazon.com . With the success of self distribution for many filmmakers and game developers, amazon.com was a good choice to start for presenting City of Rott 2 compared to the risks of going with a smaller distributor/label. $10.99 for the DVD is the lowest price it will be for a limited time. It would be even less of a cost for COR fans, but amazon.com only gives back to the film creator, about $1 for each DVD sold at 10.99 since they do all of the packaging, marketing and distribution of the film. Amazon.com was chosen for their consistently reliable service for many, and great service for independent filmmakers. They professionally package each DVD, delivered plastic wrapped with vibrant color printing of the disc and DVD sleeve enclosed in a solid DVD case. The only limitation of the service for filmmakers, is they don’t offer a blu ray option, and only allow for a single sided DVD, which limits the amount of content that can fit on the disc balanced with video quality. This entry was posted in Animated Zombie Movies and tagged animated horror, animated zombie movie, City of Rott 2, COR2 DVD by cityofrott. Bookmark the permalink.